WOW that title is a mouthful, at least it is a tasty one! My husband raved over these little lasagna rolls. In fact, he said if I ever openned a restaurant I would HAVE to have these on the menu. What a great compliment for a dinner I threw together with stuff in the fridge. Those of you who know me and/or have been following my posts know that I LOVE pesto. I could honestly just eat it right off the spoon (and have). Yum! I hope to someday have a Cuisinart food processor where I can make all sorts of great pestos, right now the jarred-grocery store kind works wonderfully. I had a partially used jar of pesto in the fridge and could not let it go to waste. Pesto was the inspiration for these lasagna rolls. I also had a partial jar of marinara sauce and a couple handfuls of baby spinach in the fridge that needed to be used. A little spicy Italian sausage in the freezer and I had the workings for a tasty sounding lasagna. Let me just say that adding pesto to your jarred tomato sauce really freshens it up. The garlic and basil really complement the tomatoey flavor of a marinara. Give it a try, you won’t regret it. Preheat oven to 350 degree F. Fill large pot with water, bring to boil. 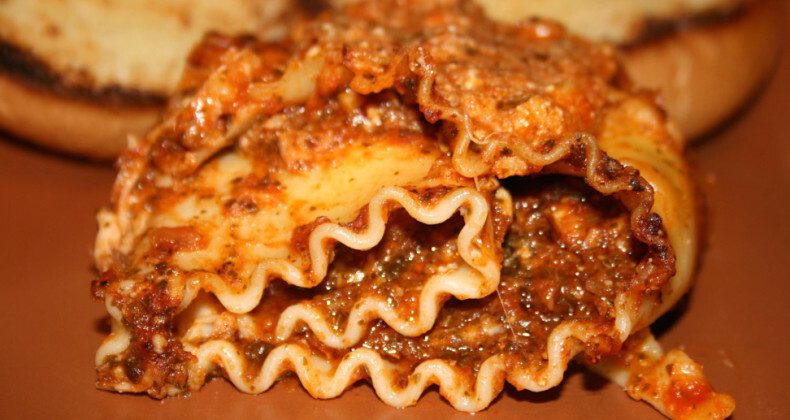 Salt water and add lasagna noodles, cook to package directions. Drain (reserving 1 c liquid), and rinse in cool water. Separate noodles on counter or cookie sheet, so they don't stick together. Heat skillet over medium heat and brown sausage, breaking up large chunks, drain. Grease 9 x 9 baking dish. Mix together pesto and marinara. Add 1/2 cup sauce to bottom of baking dish. Mix ricotta, Parmesan, 1 cup mozzarella, spinach, and reserved noodle liquid. Top with some browned sausage. Roll. Place seam-side down in pan. Repeat until all ingredients are used. Top with remaining sauce mixture and mozzarella cheese. Cover with foil, bake 35-40 minutes. Remove foil and bake 5-10 minutes or until cheese browns. ENJOY!